Kitzia Organic Market - our Saturday morning routine! We are excited to share the lovely pueblo of Vilcabamba, Ecuador with you all! I'm writing this from Chicago, as we've officially re-patriated and are back in the states for the foreseeable future, but Vilcabamba was so wonderful that we felt compelled to do it justice with one more post. Similar to the Galapagos, Vilcabamba is just so beautiful that it's best shared in pictures, so I'm including lots of our favorites here. Nestled in southern Ecuador far from many of the major tourist attractions, Vilcabamba is not on every traveler's itinerary, but we think it should be! Out of all the amazing places we've seen in Ecuador, it's our favorite place to relax. If we are luckily enough to return to Ecuador some day, Vilcabamba will be on our list, hands down. Vilcabamba is known among Ecuadorians for the health and longevity of its people. As such, there are all sorts of products marketed around what makes it such a healthy place - Vilcabamba bottled water, spice mixes, etc. After spending a month here, we suspect it's more the relaxed pace, abundance of organic/local food, and tons of walking/hiking that makes the locals here live so long. 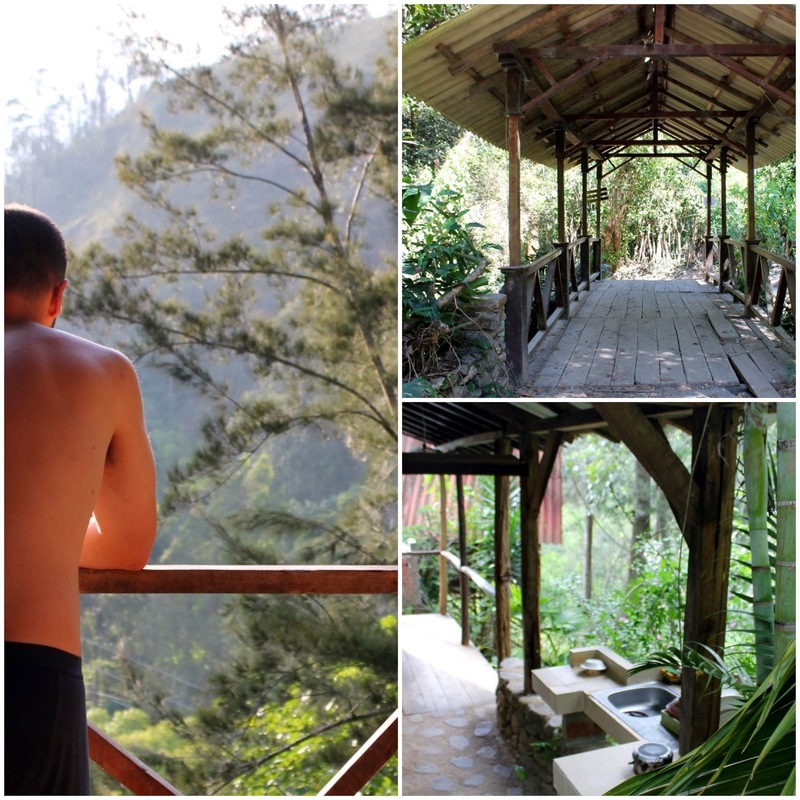 Some visuals of our cabin in Vilcabamba - a perfect place to relax! Over the past decade, there's been a huge influx of foreigners to this little village, and the ratio of foreigners to locals is higher than anywhere else we've experienced in Ecuador. The vibe is an ever-interesting blend of hippies, yuppies, and locals - and we discovered that to be a good fit for us! 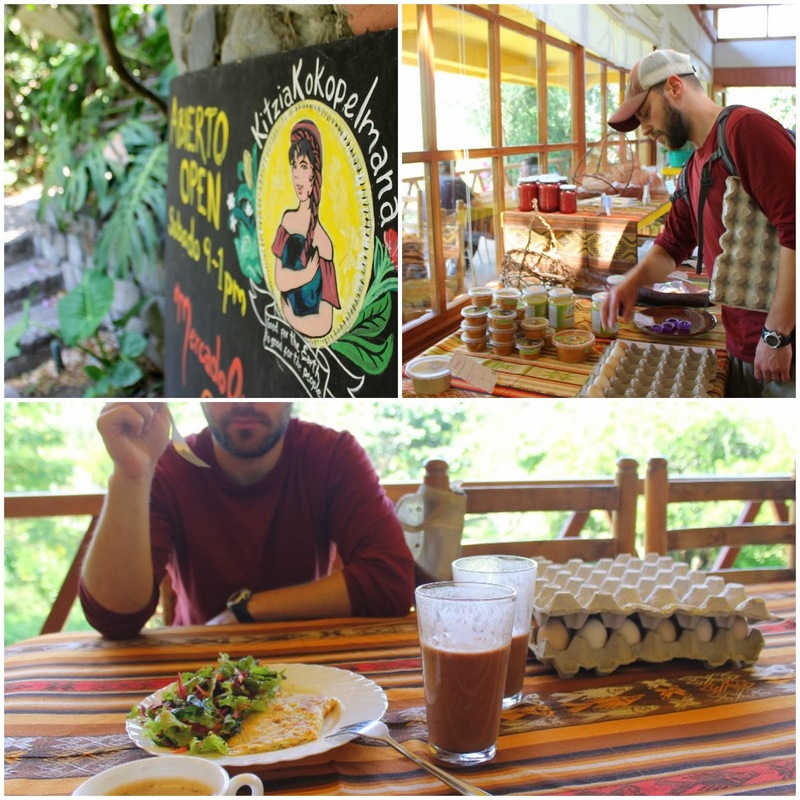 There is a huge raw food movement here, our favorite manifestation of which is the Vilcabamba Juice Factory, which we are convinced has the best smoothies in the world. The "Goji Gone Wild", with Goji berries, Inca berries, black raspberries, cacao, natural yogurt, and spirulina gets the blue ribbon. 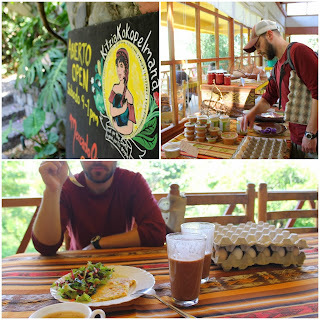 We spent our month in Vilcabamba in a cabin in the mountains with an open air kitchen and a porch with a view. After two months of constant travel in and out of noisy and hectic Quito, we were excited to slow our pace and relax a bit. We gratefully welcomed hiking, swimming, yoga, sunsets, and lots of reading into our daily routine. Our cabin was literally steps off one of the more popular hiking trails in the area, which leads to a waterfall and a mountain eco-farm. Our porch faced west, overlooking the valley and the farm that sources our beloved Juice Factory, and providing for stunning sunsets. It was an hour-long walk into town and we're proud to say that the whole month we lived there, we never took the option of a $3 cab ride, favoring the exercise we got from the walk instead. We hope that these pictures convey the beauty of Vilcabamba. Despite how much we loved our travels, we are thrilled to be home for the holidays and back with friends and family. Missing everyone back home was definitely the toughest part of our trip, and while we're sad to leave Ecuador, we're happy that part is over! 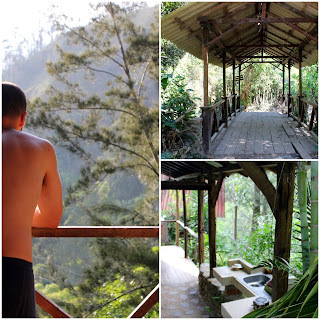 Our cabin in Vilcabamba was next to a beautiful river where we've fallen in love with a few swimming holes. Freezing but completely refreshing after a hike in the Vilcabamba heat and humidity. Since we started adventuring in 2012 with our 5 1/2 month sabbatical to hike the AT, we've heard countless people say "I wish I could afford to do what you're doing".......what we're doing being travel and adventure for extended periods of time. But the ironic truth is that they can, and we'd like to set this post aside to explain how. Let's use the best example I know of - the Aussies. If you've ever traveled internationally, you've seen them. They are absolutely everywhere. Australians have a magical ability to live lives where they work for 6 months, and then travel all over the world the rest of the year - every year. It almost becomes comical to ask them about it....."oh, I'm just backpacking through South America for 15 months, or maybe I'll go to the states for awhile, I'm not sure yet." Seriously? How do they do it??? I think it all comes down to culture. This seems to be the best kept secret of all time - life in the US is extremely expensive, both of it's own right, and by the fact that our culture makes us feel like we need to spend a ton of money. In the same vein, our culture has taught us to make traveling and taking time off even more expensive than daily life. The crazy truth is that for many people, traveling is not necessarily more expensive than day-to-day life in the US. There are countless great books out there that are trying to get this truth out (Vagabonding: An Uncommon Guide to the Art of Long-Term World Travel by Rolf Potts and The 4-Hour Workweek by Tim Ferriss, to name a few), but since this discovery has made such a huge impact on our own lives, we want to do our part to share the message too. On the whole, Americans treat vacations like a binge. We work hard for most of our waking hours 50 out of 52 weeks of the year (maybe 48 weeks if your job has a rocking vacation policy), and then we take the remaining 2 - 4 weeks, and cram into them a year's worth of holidays, weddings, visiting with friends, relaxation time, sightseeing, and travel. And because we only get to do this a few times a year, we feel justified to go all out - so we fly to Hawaii for a week, stay in an amazing hotel (or let's face, even a moderately-decent hotel there for a week can break the bank), eat out every night, drink some great wine, go parasailing, and suddenly, we've spent a small fortune on one wonderful but very expensive week. And then we find ourselves asking the question "how can some people afford to travel so much???" Well, long story short, long-term travel is nothing like blowing a chunk of your savings on a typical vacation to Hawaii. To illustrate, let me share a few examples from our experience. Below are some sample cost comparisons from a few of our bigger monthly expenses on our adventures, side by side with those same expenses while living in downtown Chicago. These aren't by any means comprehensive or exact figures, but they are a few realistic examples based on our experience, and I think they get the point across. As you can see, living in Chicago is relatively expensive. Once you factor in just the savings for these few bigger expenses (i.e., rent), you've got a whole lot of wiggle room to play with in terms of funding flights and other travel expenses. I would also like to emphasize that in Ecuador, we were doing anything but slumming it. For example, for $400/month, we had (with two roommates) a brand new three bedroom, three bathroom condo in the dead center of downtown Quito, including utilities, WIFI, 24-hour doorman, spa, gym, and a maid who cooked and cleaned all day for three days/week. There is NO WAY we could afford that in Chicago. Proportionally, it may not cost much more to travel internationally for 3 months than it does to do the same thing for two weeks. In fact, renting an apartment for three months in Quito is cheaper than staying just one week at the Holiday Inn right down the street - true story! Find an amazing, cheap, BYOB restaurant and make it your go-to if you love to eat out as much as we do. Andy's Thai Kitchen in Chicago is ours! If you have a gym membership you use less than once/week, ditch it and buy one-off classes at a yoga or cycling studio instead, or look for studio specials on Groupon. Super embarrassing, but I had one of these for a really, really long time. These little things could easily save you more than $1,500 over a six-month period of time, which can go a long way toward a trip to somewhere like Ecuador. Not so painful, right? If a leave of absence isn't your cup of tea, another option is to negotiate a remote, part-time work situation, and travel while you work. This is what Brian and I are currently doing; he's working part-time remotely for his US-based company, which is covering the cost of our travel in Ecuador. And this brings us back to the title of this post - arbitrage (or basically, making money by exploiting price or currency differences). By earning a US salary and spending your money in countries where things are much cheaper, your dollar goes a lot farther. As Tim Ferriss puts it in The 4-Hour Workweek, "Fun things happen when you earn dollars, live on pesos, and compensate in rupees." Another option - while you travel, use work-for-stay or volunteer-for-stay arrangements, teach English lessons, and find work along the way to fund your trip. In foreign countries there is often decent demand for native English speakers in the education and tourism industries. Our current Spanish tutor (yup, she's Australian) has been working her way through South America for over a year in this manner. I will make one concession - I recognize that all of this is much easier to do being a (relatively) young, unattached couple without a mortgage, car, kids, or even pets to consider. But the basic principle applies to everyone just the same: If you can afford daily life in the US, and especially if you can afford 2+ weeks of "binge vacations" every year, then you can afford long-term travel. You just may have to think outside of the box a bit to make it happen. I know it's hard to believe, but I promise you it's true. We're living, breathing proof of it! After two months of being based out of the loud, crowded capital city of Quito and filling any of our free time with weekend trips to places like the Amazon rainforest, it was about time for some rest and relaxation. Enter the small village of Vilcabamba. Kelly’s cousin Alice stayed in Vilcabamba a few years ago (you can read about Alice’s travels in South America at her blog http://alicesanderson.blogspot.com/) and recommended it highly, and it sounded like just what we needed after all of our travel and city-living. Long story short, I am now typing this from the balcony of a small cabin overlooking the mountains, breathing in the fresh mountain air with only the noise of roosters, donkeys, and cows to disturb the soothing sound of the wind blowing through the trees. While nobody should underestimate just how much noise a rooster can make, it’s still an amazing change of pace from the honking horns and roaring bus engines in Quito. Before I go on about how much we love our new home-for-the-month, I should probably back up a bit to describe the timeline between Quito and here. We booked a flight out of Quito and into Cuenca on a Sunday, and decided to take that Friday and Saturday to visit Quilotoa, a bright blue-ish green lake at the bottom of a giant crater surrounded by a hiking trail. Due to the lack of a direct and timely bus route to the lake, we had heard that the best way to get there was to rent a car. I now know that if the best way to get there in Ecuador is renting a car...there is no good way to get there. Not to worry the mothers and the fathers, but Ecuadorian drivers are absolutely insane. No offense to Ecuadorians, but their behavior on the road crosses the line from risk-taking to just plain dumb. The specific behavior inspiring my outrage is the act of passing on blind curves when there is only one lane of traffic. It wasn’t uncommon for us to see a driver with his entire family in the back of his open bed pickup truck whiz around a car on a curvy mountain road when he clearly had no idea if anybody was approaching from the opposite direction. Ecuadorians aren’t known for their good punctuality, so why they feel the need to risk lives to gain a few minutes of time is beyond me. Ecuador also ain’t the best at signage/maps, but to keep from griping too much I will just state that we got lost at least 6 times on the drive and it took us twice as long to get there as it should have. Luckily, Quilotoa was absolutely beautiful, and we still had time to do a decent amount of hiking around the lake. We stayed at a cozy little hostel right near the lake that had a wood-burning stove in each room that they lit for their guests at night. Central heating is rare in Ecuador because the temperature rarely gets consistently low enough anywhere in the country to require it, but that night we were extremely thankful for the stove. That Sunday we found our way back to Quito with less problems than we had finding Quilotoa, but it still wasn’t pretty. We flew to Cuenca, a small colonial city in the southern part of the country, where we spent 5 days. Cuenca was way more up our alley than Quito. It is much more quaint and quiet than Quito, with a beautiful river running through town and plenty of amazing and cheap restaurants. It feels more like a European city than anywhere else we’ve been, and it is obvious why Cuenca is gaining popularity as a retirement location for foreigners (primarily U.S. ex-pats). Last Friday, we took a bus from Cuenca to our final destination before returning to the U.S. for the holidays…Vilcabamba. Since we don’t plan to do any more travelling for the next month, we’ll have plenty of time to dedicate an entire post to the sheer awesomeness of Vilcabamba and how much we love it here. For now, I will suffice it to say that there are multiple hiking trails literally right outside of our door, and a river about 5 minutes from our cabin that we have made it a point to take a dip in almost every day this week. The center of town is small and quaint, with multiple organic grocery stores and farmers’ markets. The area is full of people like us who came here for a vacation and never left. Don’t worry mom and dad, we’re coming home, but if this town existed in the U.S. we would move here in a heartbeat. That’s all for now, but hopefully our next post will have a picture of a beautiful waterfall that is about a two hour hike from our cabin. We’ve already tried to find it 3 times, and yes, I blame the lack of Ecuadorian signage and maps. Luckily what Ecuador lacks in logistics, it makes up for in beauty. PS – I feel like I ragged on Ecuador a lot in this post. But I must say that the only way we made it to Quilotoa was due to the friendliness, patience, and helpfulness of all of the Ecuadorians along the way who were kind enough to point us in the right direction. Ecuador, I hope you know I love you. Have I ever told you about how much I love your almuerzos? And have you lost weight?